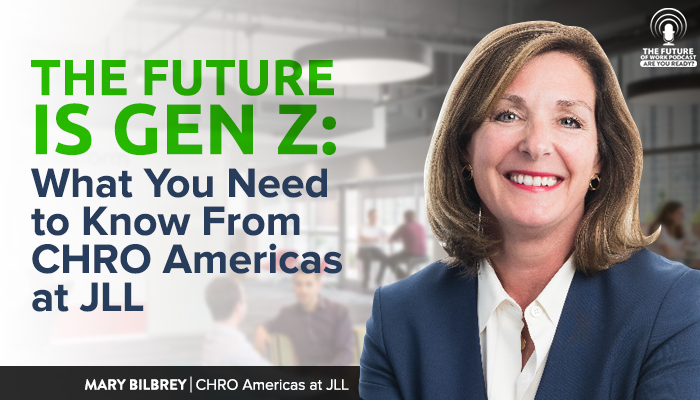 Mary Bilbrey is the Chief Human Resource Officer (CHRO) Americas at JLL, the leading integrated global real estate services and investment management firm. Mary joined JLL in February of 2016. She came to JLL from HSBC, the multinational banking and financial services company, where she was the Head of Human Resources for HSBC USA. Some of it seems to be that with every ‘new’ generation we talk about various traits that they seem to display – but in reality it is simply because they are young. It has been true of every generation – they are more idealistic, more ‘me’ focused. But much of that can be attributed to their youth. It is a ‘life stage’ versus a generational stereotype. 1. Gen Z did not experience the digital revolution. They were born into an environment where it was part of their life from the beginning. That is going to have an impact. 2. They are beginning to enter the workforce in a very strong labor market. So they have more choices – employers, work environment, vision and purpose of the organization. ●	Generational stereotypes – fact or fiction? ●	What does the future of work look like? Want To Hear More On Gen Z? Generation Z: Who Are They And What’s Their Impact on the Workplace?